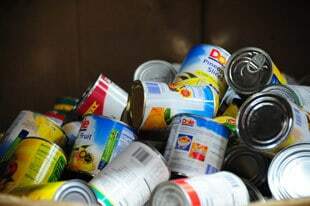 Channel One Regional Food Bank and Food Shelf, a certified member of Feeding America, is a non-profit organization that serves the mission to work in partnership with others to help feed people in need. Channel One is a proud member of Hunger Solutions Minnesota, and a partner of the United Way of Olmsted County. Channel One Regional Food Bank and Food Shelf has roots that reach all the way back to Gloucester, Massachusetts, when in the early 1970’s artist and sculptor Al Duca enlisted young street teens to assist him in his studio, enabling them to learn a skill and build self-esteem. Additional teenage projects led to increasing community and business support. A grant from the National Institute on Drug Abuse made it possible for the Channel One program to be adapted as a model for drug abuse prevention. The project’s success caught the attention of Prudential Insurance, which decided to use its network of sales offices to generate similar youth programs in other cities and towns. Rochester, Minnesota, was chosen as a site for a Channel One program in 1979. With grant money from Prudential Life Insurance and the National Institute on Drug Abuse, a group of local teen volunteers and adult leaders focused their program efforts on establishing a food shelf for senior citizens, which began operations in February 1980. The senior citizen food shelf led to the distribution of government commodities, and the food shelf was expanded in 1984 to serve people of all ages. Channel One’s umbrella grew to include the food bank, which opened its doors in February 1983. It was the first food bank in Minnesota outside the Twin Cities area, and today Channel One is the largest hunger relief network in Southeast Minnesota. Today, Channel One Regional Food Bank serves seniors, individuals with physical or mental-health disabilities, working families and individuals, people in times of crisis due to job loss, medical problems or personal disaster, and food shelves, programs and agencies in 14 counties. These counties include Faribault, Waseca, Rice, Goodhue, Wabasha, Steele, Dodge, Olmsted, Freeborn, Mower, Fillmore, Winona, Houston, and La Crosse County in Wisconsin. Come See for Yourself How Channel One Operates! Tours are available to individuals and groups of up to 20 people. Tours are free – but we wouldn’t mind if you brought a can of food as your donated “admission fee.” To schedule a tour, contact Virginia Merritt, our Executive Director, by phone (507) 424-1721 or e-mail virginiamerritt@channel-one.org. Be sure to include your name, phone number, e-mail address and date and time you would like to come.